Being a first-time mom, I relied a lot on what other people recommended to put in their diaper bag, but eventually learned for myself what I needed and didn't need. This list is meant to be a guideline as I'm sure your bag will vary depending on your needs as well, which you will figure out as you go! Obviously, you will want diapers, but how many? In the beginning, I tended to overpack, stuffing 10 of those suckers in there, eventually I got the point where I was comfortable with 5, and never once have I used them all! I highly recommend Pamper's Pure diapers. You will just need one package until that package gets low, then you'll want to make sure you have a backup! Pamper's Pure wipes are our favorite. A lot of public bathrooms do have changing tables, but I still liked having my own portable changing mat to place on top as you don't know how often those are cleaned. Plus if they don't have a changing table, you can change your baby on the floor or in the car with the mat. Babies spit up a lot, so having a burp cloth on hand at all times is a must! This is more important in the winter as you can use it to cover your baby in the car seat or stroller. You may still want to do this in the summer to keep nosey people away, so make sure you get a breathable cotton muslin blanket, like these ones on Amazon. Diaper rash happens, so it's best to always be prepared! We found that Pinxav brand to be the best! It worked the quickest. Our second choice would be Desitin. We tried Aquaphor and CeraVe as well, but they didn't seem to work as well. You can check out my review of diaper rash creams in this post. Always bring an empty bottle in case you have to feed the baby while out and about. You can always fill it with water at a fountain or sink, or bring a separate water bottle with water to pour into it. I highly recommend getting some formula sticks as they are easier to carry around than a canister. We got a lot as free samples from our Pediatrician, but you can also find them on Amazon. Yes, that is plural. I found that having one spare outfit is sometimes not enough. Babies are messy and blowouts do happen. I would for sure have at least two spare onesies and pants. I found I could get by with just one pair of spare socks as my girl didn't really kick them off until she was older, but you may need more as socks may go missing! You will want some toys to entertain your baby while out and about. I highly recommend getting the ones you can strap onto your stroller or car seat and dangle in front of your baby. You could also get links or toy safety straps too to attach toys to the stroller so you don't lose them! These are great for wiping down changing stations in bathrooms before lying your baby down on them, or for cleaning shopping carts, or high chairs at restaurants, etc. You can find the Clorox Wipe pouches in the travel section at Target or on Amazon. The hand sanitizer is for you, not for the baby. I found using hand sanitizer to be so much faster and easier than washing my hands after diaper changes. Bath and Body Works is my favorite with all their scents and you can even get cute little keychain pouches for them now. You can also find plain travel sized bottles on Amazon as well. You will always want a back up in case you forget to bring one! As a mother to a 2year old. I completle agree. A good post. Back up pacifier, yes! My daughter was obsessed with the pacifier when she was little. So agree with your list of items! I had the same thing too! We had most of these in our diaper bag, too :) I mostly breastfed/pumped, but I've always thought those formula sticks were an amazing invention for parents on the go! 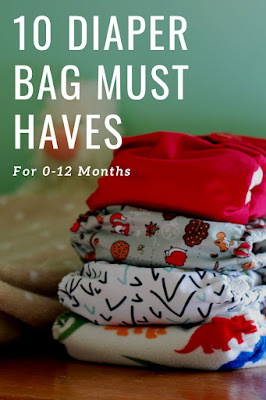 These are all great tips - I have almost 2 year old twins so our diaper bag is always overflowing haha. I also like to always have a wet bag in there in case there's no where to put a dirty diaper and/or for dirty/wet clothes. I totally agree! My must have and always on the go with me are on your list! Extra outfits, and basically extra everything baby needs is what I pack! Being prepared is key! I'm a bit of a germophobe mommy so a changing mat and hand sanitizer are definitely must-haves for our diaper bag! Thank you so much for this! As a new-mom (any day now), packing the diaper bag can seem so overwhelming as silly as that may sound. There's just so much that you need to have with you. I'm glad I read this though, there's a few items I need to add to our diaper bag. This is great! I really need this because we'll be giving birth soon. My brother is learning the must haves right now. I will have to show him this!